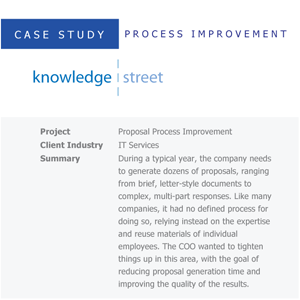 Business Process Design – we have a lot of experience working in production environments and a lot of success at finding good ways to get things done. You’d be surprised how a few simple process changes can increase your productivity. Messaging & Branding – sometimes, you need some new eyes and ears to recognize what’s important about your message. We help people boil things down, to get the maximum impact from the minimum number of words and pictures. Research & Report Writing – we can write or edit copy based on short interviews or existing material, but we can do the research work too. As time allows, we’ve done some of this longer form work under a Knowledge Street brand, and you can take a look below. Maybe you’d like us to look into something for you? From time to time, we dig deeper into some aspect of KM or Communications. We do research, talk to experts and package what we learn in a K Street report. 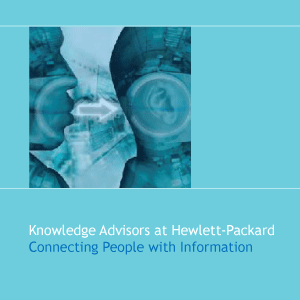 This one considers the Knowledge Advisors program at HP, designed to provide a human interface for its other KM tools. Show me. Sometimes companies know what they need to do, or at least where they need to improve. But they may also need a new pair of outside eyes and a fresh perspective on the issues. We can give them that. Show me.